Based on an Egyptian theme, Ra Roulette offers amazing gameplay experience with a live dealer to make your gambling more realistic. This game is played on the standard European Roulette table with its basic rules and betting strategies, however, comes with an additional side bet called RA which is inspired by Book of RA and uses the Egyptian symbols from the book. The betting limits in this game are £1 which is the minimum and a maximum being £1,000. The backdrop of an Egyptian style complex and the historical view of a pyramid through a door at the far end give an ancient feel to the game. 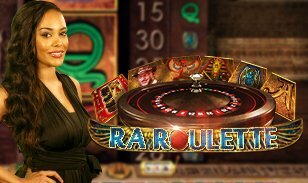 The developer of Ra Roulette is Extreme Live Gaming, an online casino game company that offers a live version of all your favourite games with professional dealers to assist you. Founded in 2013, they have earned immense popularity within just a few years with their successful games. Here, you can play the main game in standard European style where you can place straight up bet on a single number, split your bets, play the line, street, dozen or using neighbours. You can also play the outside betting odd or even, red or black, 1-18 & 19-36. What makes this game completely unique is an inbuilt side bet slot game with just a single reel and has symbols from the book of RA you can choose to bet on. There is also a game statistics shown on the left side of the screen so you can track the results of your spins that will help you implement your strategy. ● The Side bet: The slot game is the key attraction in Ra Roulette and it spins along with roulette spin table. Before you place a bet you need to pick a symbol from K, Q, book symbol and the man symbol and choose the amount you want to bet. The least value is Q that pays 1 to 1 your bet amount followed by K that pays 3 to 1 and has better probabilities of winning. The book symbol is next with just 4.54% chances of winning but offers 18 to 1 your bet amount. Finally, the man symbol which is the highest has the probability of just 1.10% but offer 80 to 1. ● Live Support: There is a live professional dealer facing the webcam to assist you throughout the game and you can chat with him/her to get instant responses. Ra Roulette is the combination of Roulette and a slot in one that gives you improved chances of winning. Regardless of what the result of the main game, you will still be able to bet and win on side game slot.